Although some controversy surrounds Orphan, it's actually quite a well written and acted thriller horror that goes beyond the clichés and stereotypes of this genre. The movie revolves around the Coleman family who have never been the same since the birth of their stillborn child. Although both Kate (Vera Farmiga) and John Coleman (Peter Sarsgaard) have moved on since the tragic event, there is still an uneasiness within the family such as Kate's alcoholism or John's philandering nature. Their two children, Daniel (Jimmy Bennett) and Max (Aryana Engineer) seem oblivious to their parents problems and in order to move on from their personal tragedies, both decided to adopt a new child within their family. After visiting an orphanage, John becomes attached to a Russian orphan called Esther (Isabelle Fuhrman), a strange little girl who has no friends but is quite eloquent with her worlds and eventually Kate succumbs to her charms. Unfortunately for the Coleman family, their problems are about to begin by bringing Esther into their home and this little girl is more demon than angel. Although Kate catches on early as to the problems of Esther, her family and psychologist believe that it is her emotional state and her return to alcohol which has clouded her judgement and to compound the situation, people are turning up dead around Esther, included injured children. Director Jaume Collet-Serra (House of Wax) does a brilliant job at moving this movie along and at times it is quite a surreal experience such as the dream sequence at the start with the nefarious looking nurses or the ghoulish pictures drawn by Esther, you start to question yourself, whether this little girl is either a supernatural creature or just psychological damaged. The clues left by the director are brilliant and if you pay close attention to them, the ending won't be as shocking as what caused the controversy. It's also great to see the alternative ending on the Blu-ray which puts a unique twist to the evil tale of this dangerous little girl. Needless to say, evil children are very evil and a tad scary but Orphan successfully manages to tell this story well. The video quality on Blu-ray is stunning with exceptional image quality, deep black levels and vibrant colours. Of course, the cinematography helps tremendously which suits the story perfectly and will easily draw you in. Of course, the ending looks even more gross on Blu-ray that will have a few viewers squirming in their seats. It's definitely one of the better Blu-ray releases for video. In terms of audio, it does sound impressive, however there are only a few certain "wow" moments in the film, thanks to the Dolby TrueHD 5.1 mix but even so, it's clean, crisp and compliments the movie nicely. The Special features department is quite well stocked from a digital copy, deleted scenes with the alternative ending and a featurette regarding the movie and inspiration behind it that are all quite interesting to watch. In conclusion, Orphan is definitely an interesting and well made horror thriller that will leave you guessing and of course shocked out of your seat. 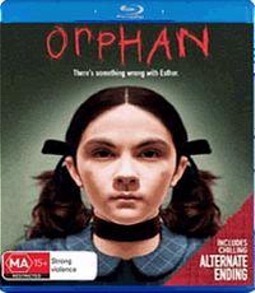 Warner should be commended on the quality of this disc plus some great extras and if you're looking to get scared, than Orphan is definitely your best bet for now! Scary is an understatement! EXCLUSIVE TO BLU-RAY Mama's Little Devils: Bad Seeds and Evil Children - Join the cast and crew as they reinvent the evil kid genre and discuss notable child psychopaths in movie history. Additional Scenes - including a chilling alternate ending.